The Grafton and Upton Railroad (reporting mark GU) is a Class III short line railroad in east-central Massachusetts. This 16.5 mile line runs from Grafton to Milford and connects to CSX Transportation lines at both ends. Following a period of decline and neglect, maintenance and repairs began in 2008 with the aim of returning the line to operable condition. 1801 EMD GP7u - mother. 1800 EMD GP7u - Slug. Click for Grafton & Upton RR. Chick Back button on your browser to return to this page. From here we continued south to our next stop. After visiting the town's railroad display, we stopped at the Dunkin' Donuts store on Main St for a couple of donuts and coffee. The DD stores are all over New England and we have stopped in several while here. But in my option, they cant' hold a candle to the mom and pop donuts shops in So Cal. The quality and taste here in So Cal are way ahead of DD. The mom and pops have nothing to fear if DD expands west. Leaving Webster we continue south on I-395 and entered Connecticut. As we are driving, I told Chris we are just a few miles from Rhode Island and did we have time for a little detour and a quick visit. Therefore I would have been in all the New England states and that would leave only a couple other states not visited on my list. So we left I-395 at Rt 101 and head east to Rhode Island. From here we made a U turn and headed back to I-395. The museum is situated on the original site of the New York, New Haven & Hartford's Columbia Junction, where the NYNH &H's Air Line and Midland Route and Central Vermont's Railroad's Southern Division all met. Hours of Operation: Saturdays and Sundays from May through October, 10:00am - 4:00pm. The six stall Columbia Junction Roundhouse along with a 1892 Boston Bridge Works 60' turntable. Chris about to enter the roundhouse with docent and our guide, Jean. Baldwin steam engine 0-4-0T 10. Dual trucks on the Trackmobile. View of undercarriage and axles over pit. The unique Gallows Signal that once governed movements of both Central Vermont and New Haven trains near Bridge Street has been reconstructed from historical plans and photos. Also the Niantic River Bridge tender shack next to Gallows Signal. The original Chaplin Station, built around 1872, was moved to the museum in 1991 and is fully restored. Engineer's stand in cab of NH 2023. Fireman's seat in NH 2023. View out of fireman's window. After exploring the museum grounds, Chris and I were offered a ride in their switcher. We will travel on the museum trackage approximately 1.25 mile of the original Air Line route. Engineer's stand and operation gauges. End of line. New England Central Railroad tracks at upper left. We then proceeded back to the museum. Freight traffic on New England Central Railroad. c. 1900 Groton Freight House. It was now time to leave the Connecticut Eastern Railroad Museum. We thanked the staff for their hospitality and making our visit informative and enjoyable. Click for Connecticut Eastern RR Museum. Click Back button on your browser to return to this page. Leaving Willimantic we drove to our next stop in Essex, CT. We were really short of time trying to get to Essex for the 11:00 AM Train. Chris decided we would have to cut off some of the distance. So when we left Willimantic, we took CT Highway 66 west then took CT 149 south to CT Highway 82 then CT 9 south to Essex. We parked with ten minutes left before train time. Luckily, Chris found the conductor who had our tickets in hand and we boarded the last coach on the train, with five minutes to spare. Essex Steam Train and Riverboat. 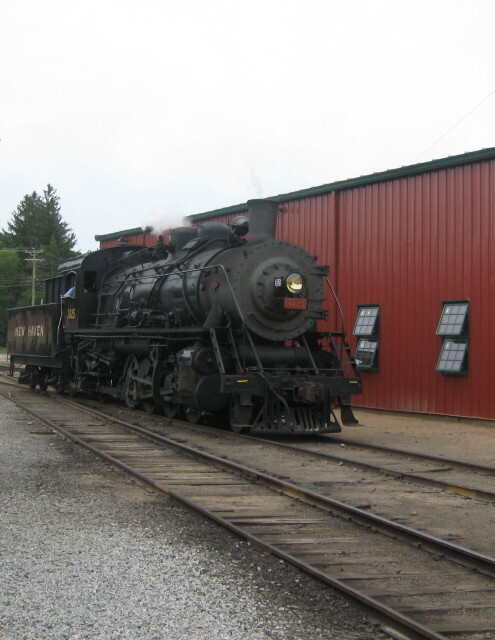 The Valley Railroad is a heritage railroad based in Connecticut on tracks of the Connecticut Valley Railroad originally founded in 1868. It is best known for operating the Essex Steam Train and the Essex Clipper Dinner Train. 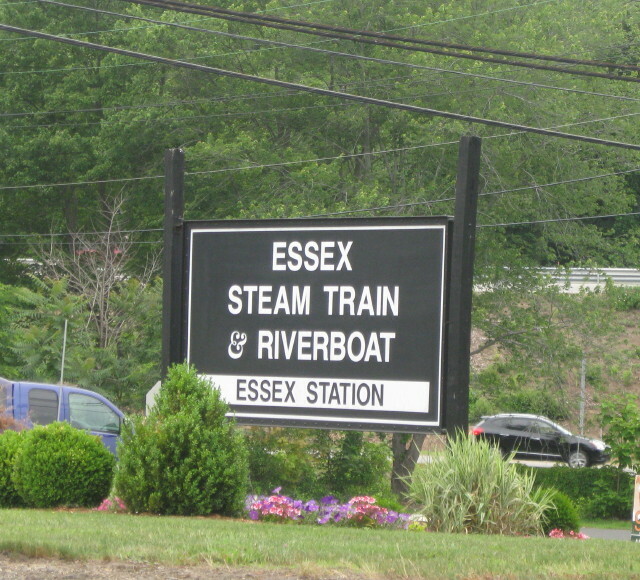 The Valley Railroad Company operates the Essex Steam Train & Riverboat. This excursion starts with a 12 mile ride aboard the historic Essex Steam Train from the Essex Station with scenic views of the Connecticut River up to Chester. The train reverses direction back to the Deep River Station/Landing. Passengers who have purchase the riverboat tickets can board the Becky Thatcher at this station. The Thatcher will bring you on a 1.25 hour trip on the Connecticut River up to the East Haddam Swing Bridge and back to Deep River Landing. The train then pickups passengers to bring them back to Essex Depot. The whole trip takes about 3.5 hours. The historic 1892 Essex Station. Sea captains' houses still line Main Street in Essex, as they did during the height of the town's shipbuilding prosperity in 1815. Among the historic buildings are Hill's Academy, one of the earliest educational facilities in this part of the state, and Pratt House, built by one of Essex's early settlers. America's first warship, the Oliver Cromwell, was built in Essex during the Revolutionary War. My ticket for 11:00am trip. Due to time constraints we would not be able to take the Riverboat ride portion today. Our train prepared and ready to depart on time at 11:00 am. Ads inside our coach car. News boy with an Extra hot off the press. Deep River Marina on the Connecticut River. Sitting in the last car gives you a great view of where you came from. Overlooking the Connecticut River was the estate of William Gillette, noted actor and playwright renowned for his portrayal of Sherlock Holmes. The focal point of the 184-acre estate is the 24-room, 8,500-square-foot mansion, which sits upon a rock formation know as the "Seventh Sister." Disembark at the Hadlyme flag stop, where you'll ride the Chester-Hadlyme Ferry, Selden III, across the Connecticut River. Explore nature up close on a 3/8-mile hike to Gillette Castle. Becky Thatcher, a triple deck Mississippi-style riverboat boards at Deep River Landing for a 1 1/4-hour cruise along the Connecticut River- bursting with lush scenery and historic sights, as Gillette Castle and the Goodspeed Opera House. Upon Becky's return to Deep River Landing, the steam train welcomes you for the return trip back to Essex. At Deep River the train's power is switch for the return to Essex. Engine 3025 begins its run around form the head to the end of the train. The engine will run backwards pulling us into Essex. The smoking, fire breathing one-eye monster is very close. Pennsylvania RR 477449 FVRR - Friends of the Valley Rail Road. Loco 3025 back on the front of the train and ready for its 12:30 pm trip. View Loco 3025 leaving station. Click Back button on your browser to return to this page. 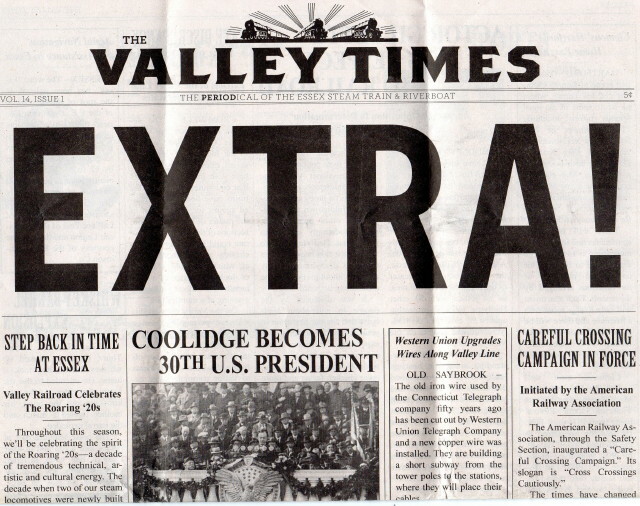 Coming in July, the The Valley Railroad Circus Train & Big Top Show. Click for Essex Steam Train. Click the Back button on your browser to return to this page. We would like to thank the Essex Steam Train for having us today. It was a great trip and we had a fantastic time here visiting it. We took CN 9 south to Interstate 95 to East New Haven and our next stop of this trip. 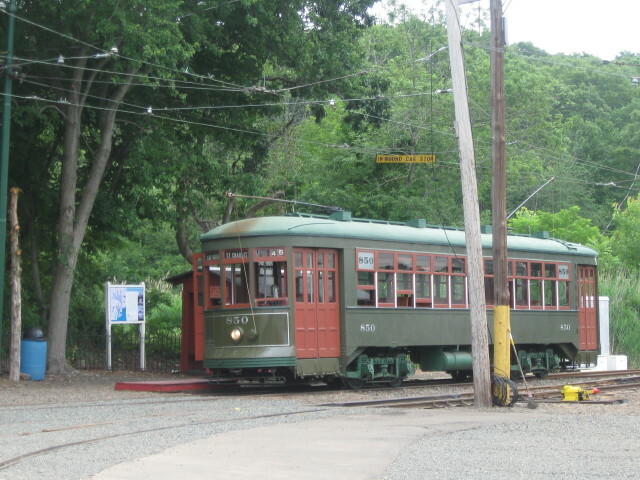 Shore Line Trolley Museum is off I-95 exit 51 northbound or exit 52 southbound. The museum contains a large collection of antique U.S. and Canadian streetcars, inter-urban and rapid transit cars. A scenic 3-mile ride aboard an antique trolley car is included with admission. We will be riding 850 today. We are located adjacent the shore of Long Island Sound. At the trolley stop we were able to get off and walk around the barns and shops looking at the equipment and exploring the cars. A trailer car is just what its name implies – a car which is coupled and towed along, trailing behind a powered streetcar. This was a cost-effective way to double capacity during peak rush times. Trailer cars were popular in the 1910s and 1920s before the ridership crash of the Great Depression. 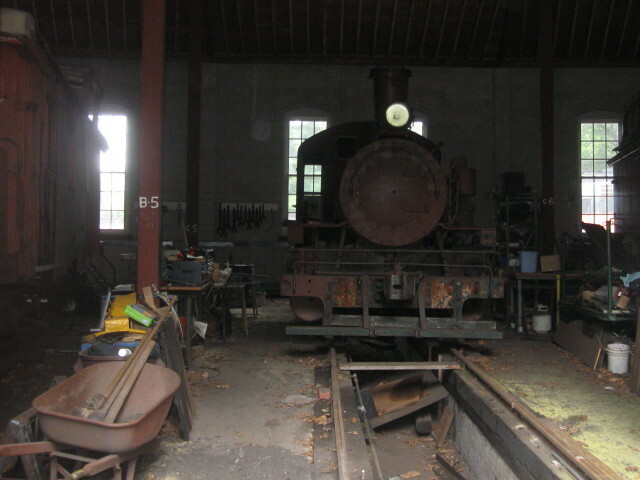 From 1936-2004, this carbody was used as the office of a local iron works in Union, NJ, a form of adaptive reuse which saved many trolley cars from destruction. The car is now being stabilized complete with reinstalled windows, a repaired roof, reinstalled trucks, and new paint job. Built in: 1921 by Osgood-Bradley Co.
Montreal Tramways work snow plow 3152 built 1925. Georgia Power Co in Atlanta 948 built 1926. ConnCo of New Haven 865 built 1906. Montreal Tramways 2001 built 1929. ConnCo of New Haven CT 775 built 1905. Third Avenue Railroad of New York City 220 built 1892. Inside Third Ave RR Co. Car 220. Click for Shore Line Trolley Museum. Click Back button on your browser to return to this page. We boarded the waiting car 850 which carried us back to the starting point at the museum. From here we drove to our next stop and a new city, Waterbury. This building sans walls on some floors fascinated and captivated me. After leaving the Shore Line Trolley Museum, we were to ride the new Metro-North New Canaan line. But we we were soon aware of the weather turning for the worst. Blue skies turning dark with major threat of a downpour. So we made a plan B and went with that. 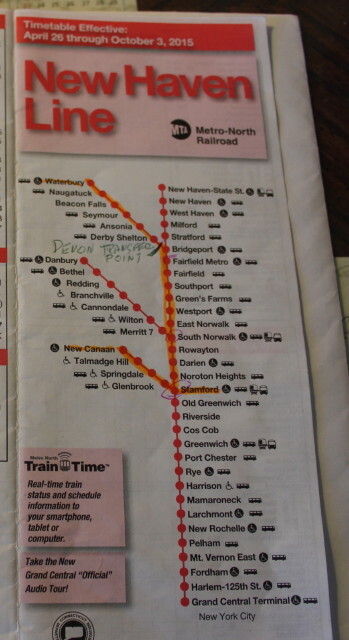 The original plan was to ride the new branch line from New Canaan to Stamford and back since Chris needed this segment to help complete his riding all of Metro-North trackage. Afterwards we would go to our motel in Waterbury then tomorrow ride from Waterbury to Bridgeport and pick up the last leg of Chris' needed trackage to complete all of the Metro-North system. Now, after checking schedules and times for weekend travel and the stars aligning to make it work, we had a Plan B. We would drive to Waterbury and take the train to Stamford, transfer to the New Canaan line and then back to Waterbury. This would complete all segments at once. It would all be new trackage for me and also provide the opportunity to ride part of the Northwest corridor segment of Metro-North's Grand Central Terminal to New Haven. This would be my second time on riding Metro-North. The first was from Wassiac to Grand Central Terminal on 6/12/15. Our train will arrive from this direction. Our train 6949 from Waterbury to Devon Transfer Point. Our train will go from Waterbury to Devon Transfer Point. At Devon Bridge, the final phase of a $5.8 million priority-repair project gets underway to maintain safe operation of the structure until it can replaced. A new, temporary transfer point (Devon Transfer) has been built where the branch and the main line meet, with a walkway connecting two four-car length platforms. Our train left Waterbury on time at 4:10pm and I was able to purchase my ticket from the conductor with a credit card as there was no ticket machines at the station. My off peak senior ticket from Waterbury to New Canaan was $3.50 one way. Metro-North train # 6549 on approach. Inside the new cars. Very nice. We arrived at Stamford at 5:55 and quickly ran to our New Canaan train for a 5:58 departure, arriving in New Canaan at 6:15. There we purchased the return ticket to Waterbury. Our returning train left at 6:28 with arrival at Stamford at 6:45. Stamford Station with our New Canaan train below. As our train #6554 to Waterbury was not due for an hour at 7:52, we found a Subway shop on the lower level and then brought our subs up to the main waiting room of the station and ate them while people watching. After eating we went out to the platforms looking for a dry spot to watch the trains. We didn't see any Acela Express trains as they are as rare as hen's teeth on Saturdays. At 7:52 we boarded train # 6554 arriving at Devon Transfer Point at 8:47. It was raining as we crossed over the walkway to train # 6954 which was waiting for us. We departed 8:52 and arrived in Waterbury 9:39. From there it was a rainy drive to our motel in Waterbury. 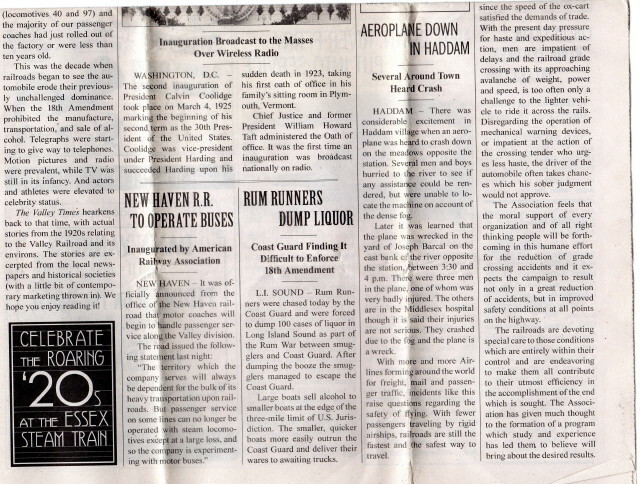 Our plan B worked well as we traveled and covered a lot of Metro-North's New Haven Line.